I don't really write about beauty products here unless I'm featuring the packaging, however I came across these last week and I thought them so revolutionary they merited a post. 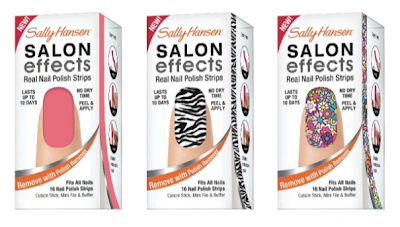 Sally Hansen's Salon Effects are perfect for people like me who are inept at doing their nails themselves. Usually by the time I finish applying the first coat, I've smudged something and have to start over. 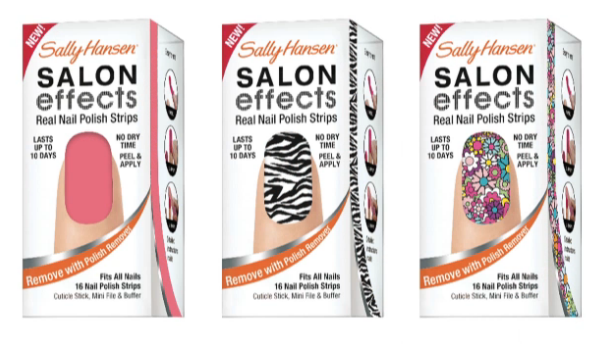 With these, the polish comes in a thin layer and each strip is applied to the nail like a sticker. There is absolutely no drying time which means once they have been applied to your nails you don't have to worry about smudging or ruining your manicure. Right now, a little disappointingly, they mainly come in extremely wild colours and patterns but so far I've used a couple of the more conservative options and absolutely love the results. They are expensive, but work out to be a lot more economical and convenient than getting a manicure at the salon and the results are equivalent in my opinion. I hope they will expand the range of colours soon, but in the meantime I will be hoarding the ones they have.